Book your party or event with us today! Jubilee Cake Studio is looking for kid friendly, energetic, responsible individuals to join our team! 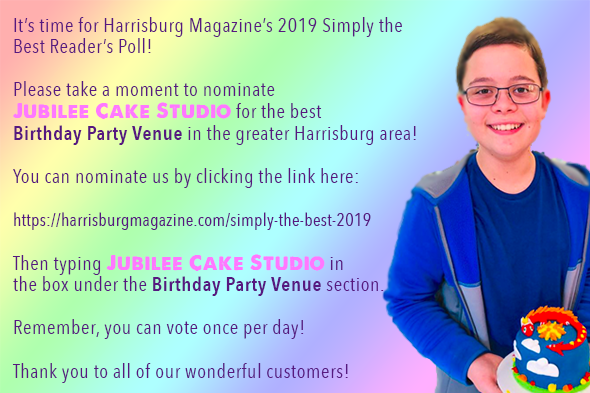 Download our application here and email it to info@jubileeCakeStudio.com or drop it off at Jubilee Cake Studio in Mechanicsburg. Download our application to apply. Thank you for booking your sweet celebration with Jubilee Cake Studio! In order to guarantee your reservation, your online payment must be made at time of booking. If you completed your reservation without making payment, please click the "Review" button in your confirmation email as soon as possible. Reservations are automatically cancelled if payment is not received. We look forward to decorating with you! On Sunday, May 12th, 2019, we will be closed in observance of Mother's Day. 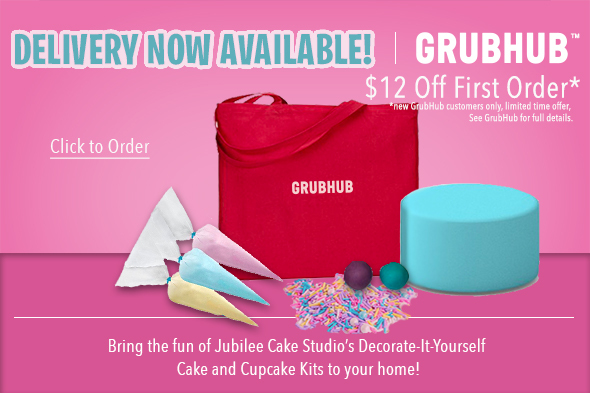 Looking to give the gift of Decorate-It-Yourself Cake to that special someone? We now have gift cards and e-gift cards available for purchase! Click here to find out more about our available gift cards. We will be opening at 1:30pm on Friday, November 16th, 2018 because of inclement weather.